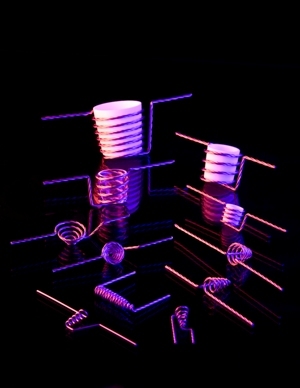 Tungsten Evaporation Baskets offer an effective method of reaching high temperatures with low current. The benefits of using tungsten baskets as an evaporation source for your deposition process include low cost, ease of use, multi-directional coatings and low power requirements. Custom fabrication, to meet your specific process needs, is available upon request. Images shown are for reference only. Actual parts may look different based on the type of wire selected. Wire types available for each part are shown in the suffix of the part number. For example, B1-.040W is made with a single strand of .040" diameter tungsten wire. B1-3x.025W is made with 3 strands od .025" diameter tungsten wire, twisted together.